It is not always easy to pick a good topic and story for such an essay. If you have not written a narrative essay before, you should read the work of other students to understand how to develop a structure, how to use your personal narrative ideas, and what topics you could use. You have to understand that the topic is the basis on which you will develop all the sections of your essay and that is why you should give much consideration to your topic for a narrative essay to write a good paper and show that this topic really matters to you. Write about things that have a meaning to you. If you’re writing about things that you don’t care about, it will be almost impossible to create an engaging and high-quality story and it can also bore you while writing it. Even if you don’t have a lot of experience in a specific field, you can find amazing stories that could be a basis for your paper or read narrative essay tips in our blog. What else can you talk about in your text? Recall episodes from your childhood, school, summer vacations, parties and holidays, hard decisions and how you had made them, personal hobbies, and student years. You can write about anything! If you already have experience working as an employee, you can also choose a narrative essay writing topics based on your working experience. You should tell only the truth in your story. Good narrative topics are usually based on what has really happened to you, not some imaginary or changed stories and that is why you shouldn’t pick topics that refer to events that didn’t happen to you. 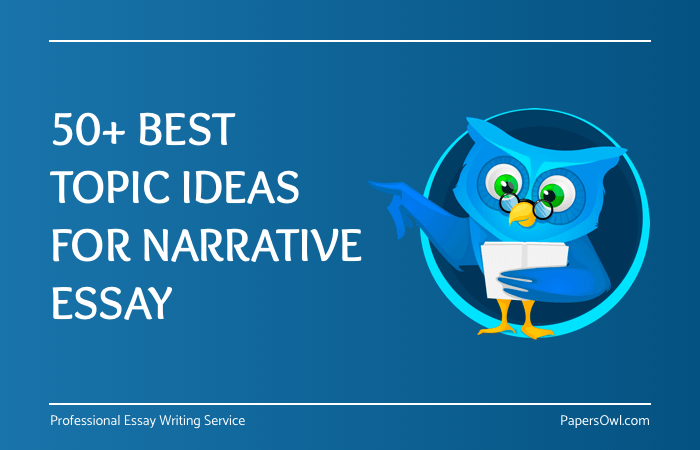 Find an example of a good topic of a narrative essay of other students. It doesn’t mean that you can copy them. It will, however, help you understand how your personal experiences and ideas can be converted into a top-notch paper. Some examples of ideas for personal narratives can inspire you and help you handle the task. Other factors to consider, If one of your goals is to catch the attention of the students and teacher, your topic should be creative and original. It also should be written in a proper and understandable way. This way your readers will enjoy reading your story and other people, who have never heard of it, may also want to take a look at it. Try reading several dozens of headlines from the media to see which of them don’t grab you to read further and how other headlines interest you to read the whole story, and apply this knowledge to create a memorable paper. Choose a topic that makes you write with passion! If you have strong emotions when you think of a specific episode that happened to you, you will be able to write a fascinating story and involve your readers and listeners into it. A time people helped each other in a crisis. Narrative essay writing is a good tool for introducing yourself because its main purpose is to show a student’s personal qualities to new colleagues and/or teacher. Tell about a superpower you would like to have and explain why. Holidays and traveling are something all students love. These topics are interesting for students because they help disclose their creative potential, and in the course of writing, they make you recall the most memorable moments. It is also interesting for the readers because they are full of vivid details, exciting turns, and interesting stories. Does your family have any fun holiday traditions? What are they? Imagine you can go on a trip anywhere, where would you choose? Would you be a space tourist? How do you imagine this? Would you want to move to another country? What was the best vacation in your life? There are many other exciting ideas but these ones are tested with time. When writing a narrative essay, you can find many more exciting topics if you look back at the most meaningful moments that happened to you. Always keep in mind that you should check the requirements of a narrative essay topic for college students given by your instructor before writing. There is a service where you can buy narrative essay or edit it online with the help of experienced writers if you have no time to write this assignment fast. When writing a personal narrative essay for college, students obtain many skills required for producing a high-quality paper. These skills include some basics – the word choice, organization, and the ability to proofread and edit texts. In addition, such tasks also enhance students’ creativity. Finally, if we talk about more complex topics, writing such a story also teaches a student how to reflect on his or her own experiences, how to analyze certain situations, and how to objectively assess the actions and decisions you have made. Besides, if you choose a good topic, it is also a fun and creative process.